Operation Rainfall: Mission 3-4: Skyward! We had to postpone Mission 3-3 until November 21st but Mission 3-4 is still on track for Sunday, November 20th, the launch date for The Legend of Zelda: Skyward Sword. This involves going to blogs, forums, review sites, Twitter, and other webpages relating to The Legend of Zelda: Skyward Sword and spreading the message: "If you like Skyward Sword, you'll also like Xenoblade Chronicles, The Last Story, and Pandora's Tower". 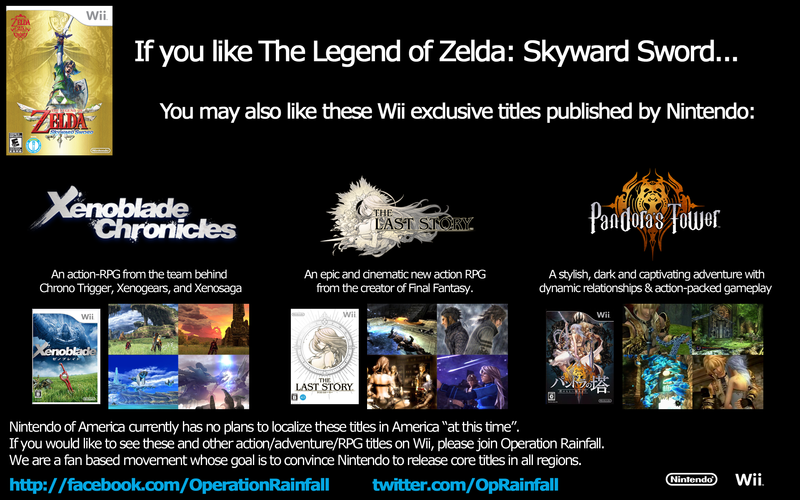 Mission 3-4 will last approximately TWO (2) Weeks, to allow hype for Skyward Sword to reach its maximum. Download the image below and prepare to spread it next week. Click here to download the image below. The full-sized image will open in a new window or tab. Right-click the image and select "Save As..." or "Save Image" to save the image to your hard drive. When Skyward Sword launches on November 20th, spread this poster on everything related to Skyward Sword you can find! If you're the creative type, feel free to make your own posters as well. Let's have fun with this and get ready for a massive surge in activity in the next few days!